Goldman Sachs leads Retail’s advisers. GlobalData’s global M&A financial adviser league table in the retail sector for FY2018. 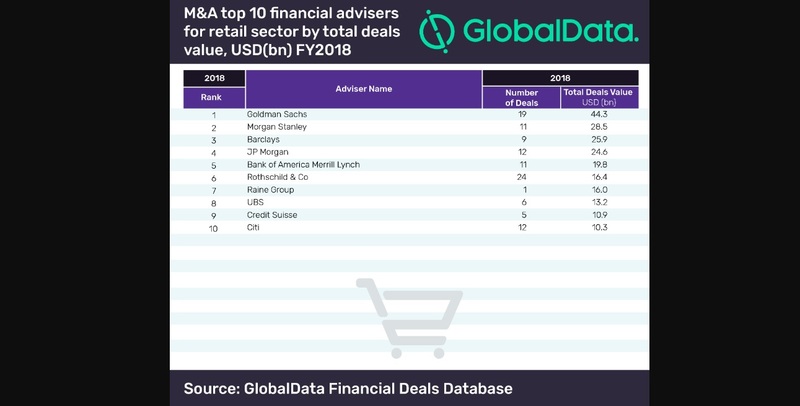 Goldman Sachs has dominated the latest M&A league table of the top 10 financial advisers for the retail sector based on deal value in FY2018, compiled by GlobalData, a leading data and analytics company. The American bank advised on 19 deals worth a total $44.3bn. Interestingly, it also worked on the second highest number of transactions during the year, including the year’s biggest deal in the retail sector – Walmart’s $16bn stake acquisition in Flipkart. According to GlobalData, which tracks all merger and acquisition, private equity/venture capital and asset transaction activity around the world to compile the league table, Morgan Stanley and Barclays worked on deals worth $28.5bn and $25.9bn, respectively, to settle at second and third positions. The retail sector saw growth in deal value and volume in 2018 compared with the year before. The total value increased by 8.93% from $134.4bn in 2017 to $146.4bn in 2018. Volumes too increased by 12.93% from 1,555 in 2017 to 1,756 in 2018. Goldman Sachs, which topped the retail league table of M&A financial advisers, also finished at the top in the global league table of top 20 M&A financial advisers released by GlobalData recently. Morgan Stanley was ranked third in the global league table, while Barclays figured at the sixth position. US-based law firm Kirkland & Ellis emerged as the lead player in the list of top 10 legal advisers, both in terms of deal value and deal volume. It advised on 23 deals worth a combined $29.4bn, including the sector’s top transaction – Walmart’s acquisition of 77% stake in Flipkart for $16bn. Interestingly, with the exception of fifth-ranked Slaughter and May, all advisers in this list were associated with this big-ticket deal. Gibson Dunn & Crutcher occupied the second position in terms of value, clocking in $26.1bn from just four deals. In the global league table of top 20 legal advisers, Kirkland & Ellis was ranked 12th while Gibson Dunn & Crutcher finished in 17th place.